Please call owner Gabriel at 425-760-2467 or Email: Gabrielsoto@comcast.net . Boat Location: Lake Stevens, Washington. 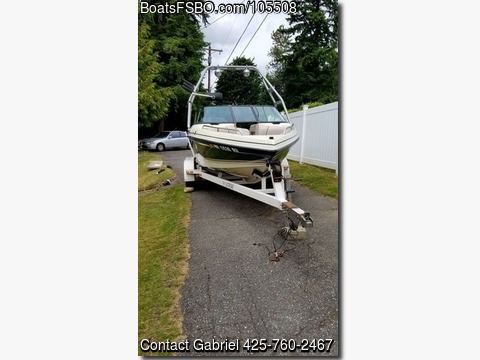 Good condition ski boat for sale. Hot Shower, Ski Rack, Tower and Tower Speakers, AM/FM Stereo, Full Gauges, Carpeting, Lots of Storage, Swim Platform, and Moooring Cover. 350 MAG MPI Tournament Ski Mercruiser Engine with Stainless Steel Prop, Only 500 hrs. Extreme Tandem Axle trailer with New Tires and Brakes in 2018. Always Winterized and Well Maintained.